Used iPod A1367 32GB in good condition. No charger included. A sync cable is included. 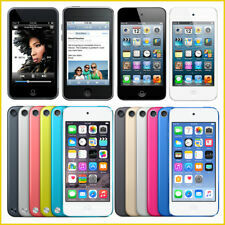 Features : iOS 6.1.6 | Wi-Fi | Bluetooth 2.1 EDR| 3.5" Color Screen | 960 x 640 resolution. • Tested for Key Functions, R2/Ready for Resale. Apple iPod touch 4th Generation Black (32 GB). Condition is Used. Screen is cracked in multiple places but it does not affect the functionality. Small spot in screen where pixels are damaged, does not affect useage. Headphone jack and speaker are both functional as well as WiFi and Bluetooth settings. Charging cord included, no cube. Factory reset before shipping. Apple iPod touch 4th Generation Black (32 GB) A1367. Condition is Used. Cable included. Shipped with USPS First Class Package. Very lightly used black iPod Touch 4th Generation (32 GB) in great condition. Screen has no discernible scratches; the back has typical light ones as expected. This is for the iPod and a charging cable. The iPod is in perfect working condition and there are no accounts or passwords on the device so it is ready for a new owner. The iPod is in good physical condition but there is a sticker on the back. 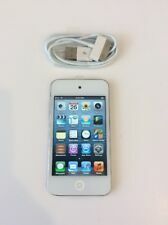 Perfect working, perfect glass , Apple iPod touch 4th Generation White (32 GB). Shipped with USPS First Class Package. 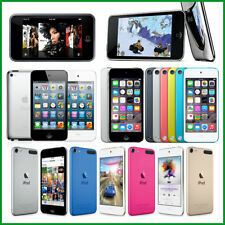 INCLUDES: 32GB IPOD TOUCH ONLY. WORKING IPOD, GOOD CONDITION, NO DENTS OR DINGS, MINOR NORMAL WEAR ONLY. IF YOU SHOULD HAPPEN TO HAVE ANY ISSUE WITH YOUR ITEM ONCE RECEIVED. No iCloud No Apple ID, factory reset and ready to go. Will include the charging cable but no charging block. Trending at $37.50eBay determines this price through a machine learned model of the product's sale prices within the last 90 days. Apple iPod touch 4th Generation Black (32 GB) - Great Condition. Includes original packaging, guide and charging cable. Device will be factory reset. Device works very well. Battery is weak but everything works. 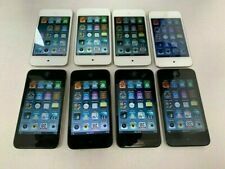 32GB 4th generation ipod touch black. IPod has been reset to factory settings so you can put your own music on it. iPod has a sticker skin on it that is protecting it. Apple iPod Touch 4th Generation A1367 Black (32 GB) USED No Accessories . Used Condition - iPod shows significant signs of use, heavy scratches on display and body. You will receive the listed iPod only. Condition is Used. The model number of the Ipod touch is A1367. The Ipod touch is in good condition and with very light wear on the front screen and is in used condition on the back of the Ipod touch with just scratching. The iPod is in good condition with minor signs of use. Includes: iPod only. This is for the iPod and a charging cable. The iPod only shows typical signs of use but there is a chip missing in the top left corner. BigTechLiquidation Cosmetic condition: ---Has sings of cosmetic wear as scuffs and marks,minor scratches. Please see pictures for details. Functional condition: ---Fully Functional.Holds 90% charge. Included: ---iPod ---Charging cable ---Headphones Not Included: ---Any Other Accessories. Our Policies: Payment: Tax Policy: ⦁ Buyers from Ohio state will be charged 8 % sales tax. Shipping and delivery details: ⦁ Make sure that shipping address is correct and matches address provided by Pay Pal. ⦁ We DO NOT ship to APO, FPO or PO BOX address or military bases. ⦁ If your address is not correct or is not confirmed by Pay Pal, we are not responsible for safe delivery. ⦁ We are not able to change or modify the address before or after item is shipped. This is for the iPod and a charging cable. The iPod is in perfect working condition. The IPod touch is lock and need to be reset by the buyer. We cannot give any Support in this process. see pictures for actual condition for this item. 1 day shipping Free Returns Don’t forget to check out my eBay store to check out other items that may spark your interest. 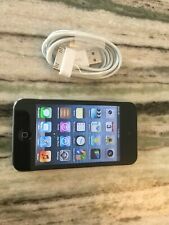 Apple iPod touch 4th Generation Black (32 GB). Condition is Used. Shipped with USPS First Class Package. These Apple iPods are in Fair Condition and show signs of use (scratching, scuffing, dings, dents, etc.). Screen will have scratches that may or may not be visible in photos. We rate this device a 5 out of 10. For Sale : Apple iPod touch 4th Generation Black - A1367 - 32 GB - Fully Working - B Grade. Functionality : Item has been professionally tested and inspected. Our tests show that all features work properly.